This type of sport is suitable for everyone! For beginners, professionals, kids, youngsters, for everybody who enjoys fun times on the water! Even if you are first time over there, “Aquaski Ada” professional will help you to pop up and ride! Ski center at Ada is open during whole year and ski season starts from 1st of May and runs until 30th of September. During season time, thousands of beginners learn to ski every year. 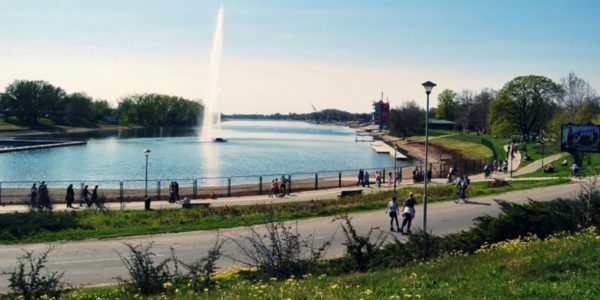 Ada is definitely among the most attractive locations in Belgrade, because lifts for skiing represent a first-class tourist attraction and unavoidable recreation and entertainment complex. Every year they have a special treat for all the ladies in town! Free ski school for all the girls who want to learn and become a pro on the water! Skiing on the water is perfectly safe with the use of protective equipment (safety vest and helmet). Whole day pass – 30 Euros. If you need any other info about Belgrade, whats app us any time.